The moment I disembark at Charles DeGaulle Airport in Paris, something starts to happen. It’s an odd sensation, kind of like that moment when the Nicolas Feuillatte Champagne I’ve been knocking back begins tickling the backside of my eyeballs. At first it’s barely perceptible. Then it begins to bubble up as I watch the people in the airport, on the bus to Place d’Étoile, on the walk to the apartment we rent on Rue Balzac. But it doesn’t hit its effervescent climax until The One and I are sitting in a bistro tucked away somewhere on the Left Bank, watching Parisian life flit by. I call it That Paris Effect (TPE). Some ill-informed doctors would call it psychosis. As I eye incredibly dressed, impeccably poised Parisians–you can easily tell tourists from locals come July–I begin a mental morphing process. Walking along the rues, boulevards, and quais that first day, I sense my posture improving, my spine elongating, and–pop!–I lose my dowager hump. By le quatrième heure, the transformation is complete. My spoken French–which, when I’m stateside, is a cobbled-together mess of nothing but present tense verbs, the propositions “de” and “à,” and the phrase “pas de problème“–turns fluent. Chic saleswomen in Saint Germain des Prés wearing Dior and Christian Louboutin marvel at my accent–actually my lack of one–when they discover I’m American. This situation will last only a few more weeks, I think, before the French government gets the intercontinental memo that I’m in the country and bestows upon me the Chevalier de l’Ordre des Arts et des Lettres medal plus French citizenship. The only snag: I can’t look at myself in mirrors, shop windows, chrome fenders, or The One’s sunglasses. Otherwise my true size intrudes, the fantasy crumples, and I’m just another gros Américain. Oh, reality, thy sword is sharp. Once in utter denial of my clomping American frame, I move leopard-like through the city, cheeks sucked in, eyes half-lidded, on my face an am-I-not-incroyable? look. 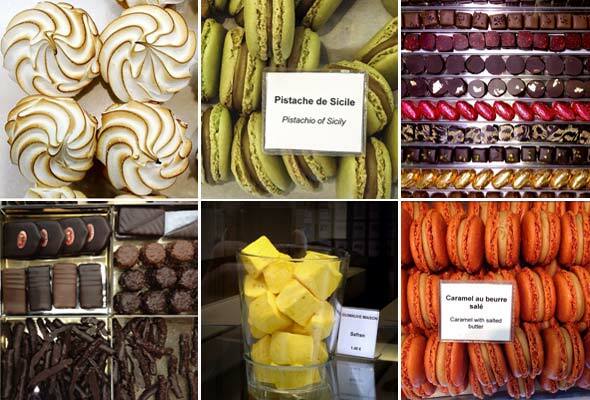 And it’s only then that I can enjoy all the comestibles a Parisian eats–bloody steaks, bushels of pommes frites, foie gras (yup, I still lap it up), croissants, tartelettes, and chocolates–and never, ever gain a pound. For real Frenchmen don’t get fat. Ever. That’s the best benefit of TPE. And that’s when The One and I attack our hit list. The first place we always descend upon is the Rue Poncelet market. 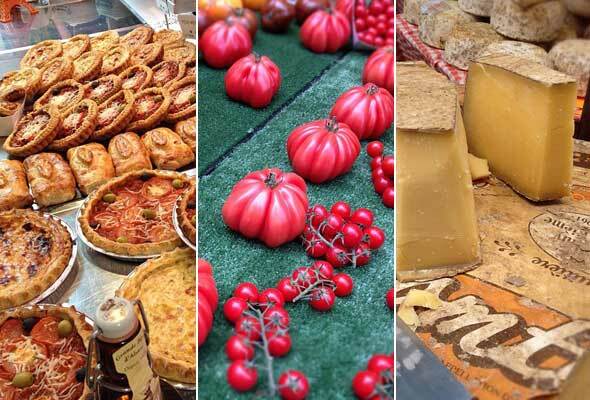 It’s a short stretch of street lined with fruit and vegetable stores, cheese and fish mongers, chocolate shops that sell only items that are bio (read: organic), charcuterie and rotisserie storefronts, butchers, bistros, patisseries, and just about everything else you could possibly want. We stock up on groceries (about 100 euros for four meals), one of which we had the pleasure of sharing with the charming Jamie Schler as our guest. Also on our list was a 9 p.m. reservation at Bistro Paul Bert, a tradition for birthdays and anniversaries these past three years. The manager, a tall, strikingly handsome man who just exuded indigenous TPE (which is far stronger that the summoned kind), chided us for being not even 15 minutes late. Unaware of what lurked beneath my oafish American exterior, I shot back my own brew of TPE, and he actually backed off and apologized. The flat-out old-school bistro was still very good, but not as spectacular as on our anniversary last year. Local friends had advised us in recent weeks to avoid the place during the height of tourist season. We should have listened. 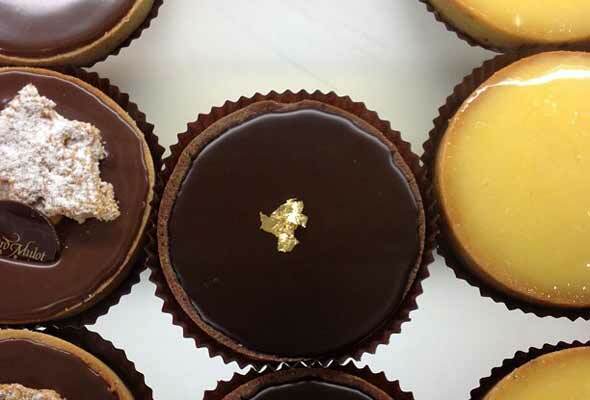 Paul, a chain of rather good patisserie-boulangeries, is our fallback for gourmandises and chocolate tarts (which we eat for breakfast, a French faux pas) and for that I have no shame. It’s close, they know us, and they never tire of our questions. But Alisa Morov of Sweet Pea Baking in Paris challenged me on Twitter to visit Gérard Mulot, a superb patisserie in the 7th arrondissement. (Eat at a marvelous pastry shop as a challenge? Please.) I had heard of his place, but never had a chance to delight in his delights, so his tartelette de chocolat noir was in my crosshairs. The One and I have re-added going to his shop to our bucket lists–it was that sensational. La Dorie gave us a short list of must-eats, all of which were impossible to get into. Le Pantruche, a tiny place near Pigalle, was one spot she and her husband, Michael, visited twice in but a few days–high praise from the Priestess of the Prés. After calling from the States for two weeks and getting an answering machine with a message in the most machine-gun-fast French I’ve ever heard, we simply showed up for dinner one night. The waiter, Edward, who clearly has a crush on La Dorie (he lit up when I mentioned her) didn’t emit even the merest Geiger-counter hint of TPE, so I toned mine way down. He was gracious and patient as I fumbled with my iPhone and The One with his Blackberry to secure a lunch reservation. The next day we sauntered in only a few minutes late, and Edward excused himself from a table and shook my hand and clapped The One on the back. (He may do that to all his guests, but if he does, I don’t want to know. I felt special.) The meal was deceptively simple, with clean flavors and beautiful presentation. We had a vichyssoise with a dollop of brandade (a creamy, lovely mess of salt cod and mashed potato). 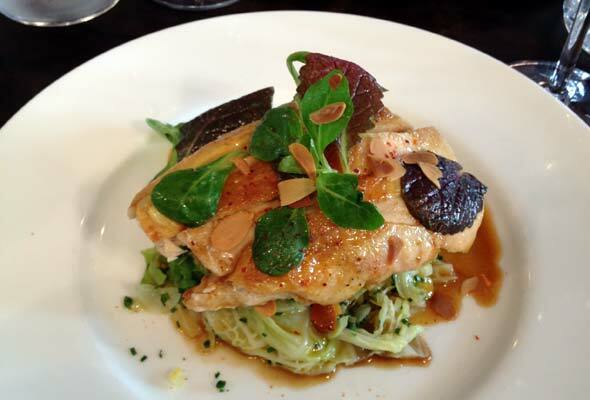 For my plat, I had roast chicken over shredded vegetables and pickled Savoy cabbage. The One had a gorgeous fan of seared veal atop a puree of pea and potato. He stunned me by getting the Grand Mariner soufflé–with a small pitcher of salted caramel sauce, thank you very much–instead of his usual fix of anything chocolate. 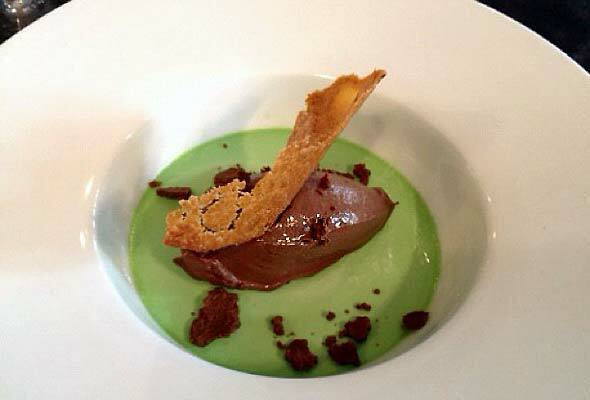 I ordered the chocolate gelato sitting in a puddle of chilled and thick mint crème anglaise. In the Game of Thrones, Dessert Edition, I won this battle. The rest of our dining was spent either gathered around the tiny coffee table in our living room eating our Rue Poncelet booty or grabbing a quick bite on the go at some not-worth-mentioning brasseries. (Okay, St. Regis on Île Saint-Louis.) Apparently, TPE made me less hungry because I actually–please make sure you’re seated or holding on to a heavy stationary object like a fire hydrant or door frame–skipped two meals. I KNOW! I thought the same thing. I closed out our week in Paris with a must-do, must-eat, must-gawk Sugar Walk led by Bryan Pirolli and hosted by La Cuisine Paris. Bryan led us through the Marais district, stopping at more than a dozen sweet spots, of which I availed myself most heartily. One surprise I was moved to discover: Comme à Lisbonne. This tiny sliver of a shop serves only pastéis de nata–those amazing custard tarts from Confeitaria de Belém–that are so exciting, they’re considered a sexual aid in Lisbon. And I can safely say, after having eaten these tiny wonders in five countries, these are the best outside of Belém. Period. Go. Now. It seems as if TPE isn’t limited to me. Renee was surprised by her husband, E, who gave her a trip somewhere in the world to celebrate her birthday–and only when she saw the airport gate blinking PARIS CHARLES DE GAULLE did she find out where he was taking her. Four days later, The One and I were boarding the same flight for the 22nd anniversary of my 30th birthday. So Renee and E came to our apartment for drinks before dinner one evening, and she was gorgeous. Slim, petite, with cheekbones one could mistake for plums, Renee is often mistaken for a Parisienne, even without TPE. But that night she was TPE². She had on her pair of Cinderella shoes–so chic, so elegant, so French. I felt my own illusion wobble a bit. But I knocked back another glass of Nicolas Feuillatte and asked, “Would you like to see the view from the balcony?” Nothing like a sunset over the roofs of Paris to steady the psyche. Having just returned from Paris, stayed at Hotel de Buci, on Rue de Buci in the area St. Germain, I hung on your every word and began to relive the recent memories of Paris. You nailed it!!!! Why, thank you, kind sir. Do you visit Paris often? Sounds like a great trip! I’ll have to go myself sometime and see if I experience that lovely TPE. You must, you must, you must, Sara. Even if only once. It’s a lovely city. David, you’ve summed it up pretty perfectly I’d say. TPE is the reason I keep on coming back. It was a pleasure to share an afternoon with you on the Sugar Walk – glad to be a little part of your summer! Mardi, and a heartfelt thank you to you for introducing me to La Cuisine Paris and to Bryan. I shall return to them often, too. Your photos are amazing and I must say that chocolate tart was a work of art, I bet it was amazing! Have a wonderful trip and please keep us updated on your travels (I’m heading to northern France in September on a road trip to visit the WW2 sites, our English friends are planning it and I think it will be amazing! I’m researching some nice restaurants and markets to try there). First of all, David, I apologize for using “amazing” three times in one post. That comment was written very late after a long day. As for northern France, apple tarts slathered in freshly churned butter will surely cross my lips (most likely repeatedly). I do harbor a secret fantasy to wander the lanes of a sunny pear orchard and pluck a few for myself (I can imagine a French farmer chasing us off his property with a pitchfork, haha). My other wish list item is to sample at least three regional cheeses, such as Camembert, Livarot, and Neufchâtel. Suprisingly, I found Neufchâtel at a little market outside Santa Barbara and I’ve sampled it…delicious beyond belief. No apologies necessary, Cathleen. Yes, you must try those cheese, bu you must also sample Pont l’Évêque and Boursin–both from that part of France. Marvelous–and all in their raw state. Because my dear Jamie, you were part of it. Having lunch with you at the apartment, perched on those stools over the counter, was a delight. 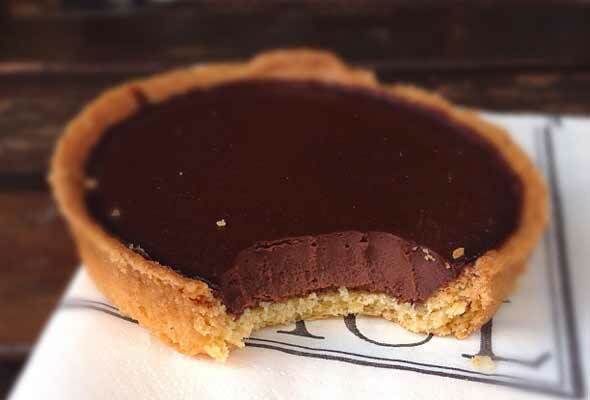 And when do you eat chocolate tarts in Paris (and you know you will), DEFINITELY go to Gérard Mulot. Superbe. Love. Even as a local, I find myself dipping back into TPE though it’s far more fleeting than when you visit. I don’t know if you ended up making it Semilla but if not, I’d love to take you on your next trip! Glad you had a good time at La Cuisine with my pal Bryan! Hi Lindsay. We didn’t make it to Semilla, but there’s always next year. And I’d love it if you’d take me. It’s always so much lovelier when a local gently leads you by the elbow. David, you have such a deft hand with a phrase & I love your idea of TPE. My one and I were there in June for just a few days. It was his first visit, my second. We stayed in Le Marais, my favorite area, and loved just ambling around the streets. Sadly, we only had the opportunity for three dinners during our short stay–one of which was unmemorable, one unmentionable, and the other fine but not brilliant. I’m not concerned though, it just means we will have to go back and find the memorable meals–and catch up with Jamie, too! Amanda, danke. 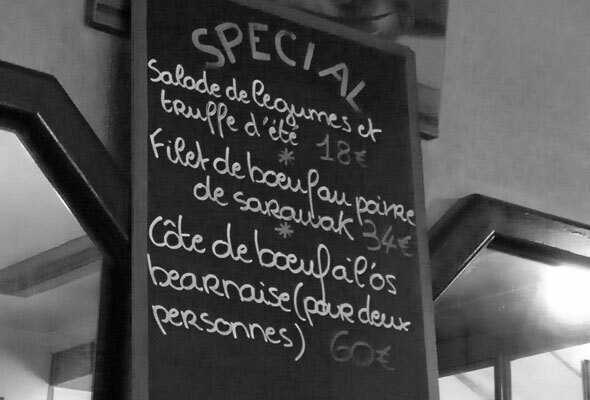 Yes, I find it kills to have a bad meal in Paris (it can happen despite what many say), but there is always tomorrow–or next trip–to fix that. I hope you and Your One have a great trip whenever you visit next. Where and when was that? Thank you, Sita. I’m glad to know it wasn’t just me being disappointed in Paul Bert. Perhaps TPE is wearing off there. But whatever luster was lost at Paul Bert, it certainly was picked up at Le Pantruche. You know, I’ve never been to Paris, and now I almost feel like I have via your utterly intoxicating prose. Except I’m now ravenously hungry. Magnifique, as usual! Shame, shame, Katie Girl! On your next trip to London you must make arrangements to visit. It’s a short jaunt by air. David, this was lovely. I would like to go to Paris every year, but make it about half that. Do you stay at a friend’s apartment or do you use a rental service? If the latter, which one? We’ve tried several and had great luck last year with a perfect spot in the Marais. Thank you for the vicarious visit, especially to my favorite market! Erin, thank you kindly. We rent an apartment from a friend of ours. 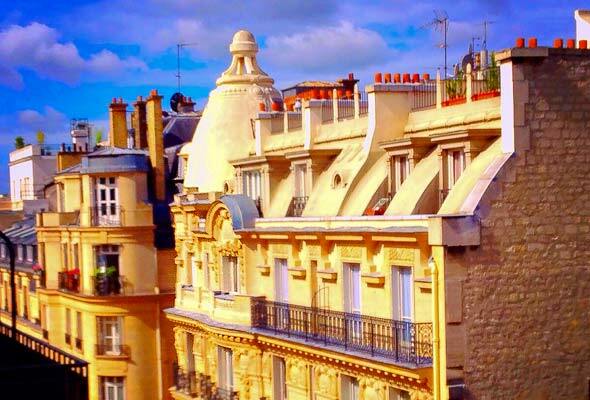 Where in the Marais do you stay? No. Have not been to Paris except this once. It does pull one back, doesn’t it? I rewatched, “Midnight in Paris,” and WA showed St. Germain de Pris in the opening montage. Owen Wilson’s character mentioned brasserie lipp in the first few minutes. We ate there on our first day. It was around the corner from the hotel. There were pastries, chocolates, street dancers, musicians, baguettes, beautiful people nicely dressed everywhere. It is a very sensual city. Demonstrations of affection are not hidden. There are caresses, fondling, romance seen all over. There is beauty everywhere, music, good food and romance. If you have a heart and a soul that is alive, you will love Paris. I couldn’t agree with you more, Stu. Well put. Try to make it a annual or bi-annual thing. You’ll thank yourself. Loved this! Ahh, Paris, je t’aime. For almost a decade, I smuggled (ahem, packed) a Thanksgiving dinner and headed off to Paris, spent two weeks with my best friend, and cooked a Thanksgiving feast for 15+ Parisians in a kitchen built for a mouse. And I loved every minute! Merci, David for bringng Paris, and all it’s charm, to life so wonderfully! Alex, my pleasure. But tell me: I hope it wasn’t the turkey that you were smuggling over??! You betcha! The biggest Butterball I could find! (the only dinde i coud find was a scrawny 7 lb bird at Fauchon…for $150) It stayed nice and cool on the plane. Worried I would be arrested by French Customs agents, I called the French Embassy which offered the following advice: “When you arrive at the aduane, just give a ‘beeeg’ smile and a ‘beeeg’ bonjour, and you will be fine.” Worked like charm for over a decade! Wonderfully entertaining story David. TPE perhaps? I always feel as if my entire wardrobe needs an overhaul when I go there, that I’m suddenly too frumpy to live! That because you’ve been looking at yourself in reflective surfaces. Up and out, the gaze should be, up and out! Ahhh, I know the TPE well. It can be used to explain the silly Parisian clothing purchases I have made over the years. Trust me, navy and white polka dots only work in Paris in the spring. All my euros now go to chocolate. Sounds like a lovely trip, David. Good for you! Dare I say you will always have Paris? Karletta, see I never buy clothes in Paris partly because a.) they’re expensive, and b.) it would positively pop my TPE bubble. (I tried squeezing into pants while in Lisbon in 2003; it was a disaster then, and that was many pounds ago.) So no stateside buyers remorse here. People who live in a tourist town complain about us tourists–or at least, many do, and they’re ready to grumble about the negative aspects of their town to anyone who is (foolishly) excited by it. I love seeing a place though an appreciative tourist’s eyes. The excitement, the awe, the joy, and an eagerness to share the experience with anyone interested makes it feel like they wished you were there to experience it, too. They forgive the foibles that stick in the natives’ craw and have that good time in spite of it. I’ve sort of been intimidated by Paris because of the alleged judgemental attitude toward Americans by Parisians. I won’t be anymore! Thank you for this tour…and for that! Susan, you’re more than welcome. Many of the locals and expats I spoke with had a list of complaints about Paris–the subway, neighbors, etiquette, the government, etc. Strip “Paris” out of the equation and it sounds just like what New Yorkers, Chicagoans, or Los Angelinos gripe about. But when you ask these Parisians and expats would they want to move, the answer is loud and clear, NO! I agree there is something lovely and sweet about a tourist who sees your city through new eyes. I think it gives you, the native, a different perspective and new appreciation for your home. And there’s no need to be intimidated by Paris. At all. When I began traveling there 20 years ago, I did detect an indifference to Americans. But over the years, I’ve seen it change. For example back then, when I would attempt to speak French (which I knew so much better), Parisians would automatically switch the conversation to English. Now when I speak French (which is woefully inadequate), they happily prattle on, adding a few English phrases when I have that deer-in-the-headlights look. You put it well and I agree, when you take “Paris” out of equation, it could be any tourist town, anywhere. I live in the SF Bay area and I’ve experienced good and not so good in SF, too. I guess when we’re on vacation, we forget that our host city is made up of folks just like us, working stiffs, except they are on the job (and we are part of said job) while we are carefree and on vacation; different perspectives. A little appreciation extended to the working stiff can make the experience better for both! I think so, Sue. And, for me at least, gives me a kinder take on NYC when I return home. But then it usually takes just a week or two of being snarked at, run into with shopping carts at the store, or entirely ignored before it wears off! Susan said, she has been”…intimidated by Paris because of the alleged judgmental attitude toward Americans by Parisians”. This is because Americans believe that all things should be done as they are done in America, even when they travel to another country with its own culture and way of doing things. The American tourist does not learn that there is a certain decorum expected when you enter a shop, you greet the owner with a pleasantry. You say, “thank you” in French when you exit a store or shop. Bread plates are not served at restaurants. You break bread at a table and let the crumbs fall where they may. Butter is not served. Ice is not served. Your check at a restaurant is never brought until you ask for it. There will not be a judgmental attitude toward you if you learn some courtesy words and learn to order simple things in French like a coffee with or without cream. Wine, red or white. Study up before you go. It will enrich your experience greatly. Thank you, Stu! I appreciate the good advice. Stu, I think it’s more than that, though. It also depends upon where you’re traveling from and what you know. If you’re not familiar with city life or travel in general, Paris can seem overwhelming and intimidating. It’s similar to the reason I don’t go to formal events in my industry–I feel so intimated by these big names and fancily dressed folk that I cower in the corner or spend a lot of time pretending to go out for a smoke. I suspect it’s the Americans who aren’t intimated who contribute to the stereotype of the big, brusk, inconsiderate tourist. And brushing up on the country you’re traveling to is a very fine suggestion. And that works in reverse. When I was a waiter at Windows on the World I used to hate when Europeans would sit at my tables for hours and hours, eat very little, and leave no tip. Some Saturdays I would walk out with $50 in my pocket, when a regular Saturday would net me $150 to $200. So there’s much to learn on all sides! I want to just add my thoughts in response to Susan and Stu’s comments (if I may). I remember many many years ago my French husband ran into a small shop in Paris (I waited for him outside) to ask information of the salesperson – he may have been looking for a specific book – and he came back outside and said to me “If a French salesperson is ever rude to you, don’t think for one minute it is because you are American. They are rude to the French as well.” In all the years I have lived in France, I have come up against rude, judgemental French people and kind, helpful and friendly French people. I have come to understand much about their psyche and truly being American or anything else has little to do with how you are treated. I agree with Stu that there are very strict, albeit tacit, rules that should be followed and just making the effort is appreciated. I think anyone anywhere appreciates a visitor to his/her country who makes an effort to understand the hows and whys of the way things work. And having lived in Paris I too have gotten fed up with tourists simply because I have wanted to get from point A to point B (getting to work on time) and have been blocked by hoards of gawking tourists. And about TPE – the longer I live here, the less I feel it. Oh, I love Paris now more and more each time I visit (as a tourist now!) but I now see the French for what they are: real people, flaws and foibles and all, and I am no longer intimidated. So David, you just have to come back more often! Jamie, my question is: Has that changed? You said the episode with your husband happened many, many years ago. I found things are different now. But as you, David Lebovitz, the folks at La Cuisine Paris, Mardi Michels, Dorie Greenspan, and just about everyone else I spoke with who lives full or part-time in Paris says, Paris has the good, the bad, and the ugly–just like any place. And, at least for now, I’m not sure I want to go back so often that I experience the latter two. That’s part of the wonderful things about travel: You go somewhere, you leave the world and problems you know behind, and you can be selective in your experience. Underneath it all, I love, love, love the idea of a national character. We American DO do things differently than, say, the French or the British. And I love that difference. I enjoy digging into a burger with my hands, while the proper young Parisienne with her dog at her feet cuts into it with a knife and fork. I hope she would think affectionately, “How American, how bold!” as I think, “How French, how elegant” with equal respect and affection. I really don’t think anything has changed in the French character in 25 years. I always had the feeling the French love Americans (even as their feelings towards the US have fluctuated). But as I said, their character is their character no matter who is standing in front of them. And yes, everyone and every city (even from French city to French city) has their character and I do think that part of the Parisian character is influenced by the quantity of visitors. It’s funny, but now whenever I get back to NYC I fall in love with it and the people and would give anything to move back – even though I left it 25 years ago with a bad taste in my mouth. Yes, being only an occasional visitor does allow us the luxury of seeing only the beautiful and wonderful. Or we hope so. Beautifully written article and great pictures. I very much appreciate both your recipes and writings. 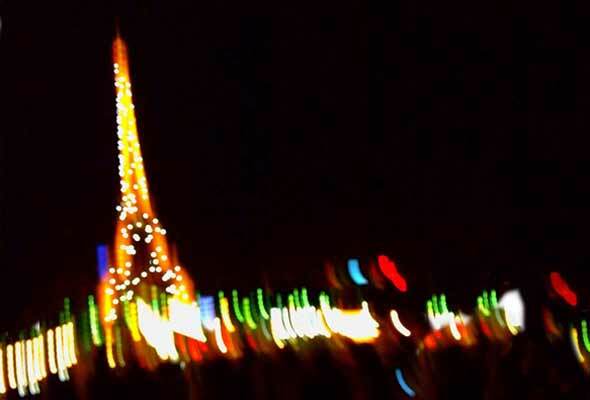 Brings me back to the whirlwind three days my wife and I spent in Paris last summer. We’re already saving for our return in two years. Which brings me to my question. The view off of your balcony very much reminds me of the short Wes Anderson film Hotel Chevalier. Please tell me, what was that picture taken from? Thank you, AndrewP. I hope you get to Paris in two years, and if you do, make sure to drop me a note. That particular balcony is on Rue Balzac, two blocks off of the Champs-Élysées, looking northwest. 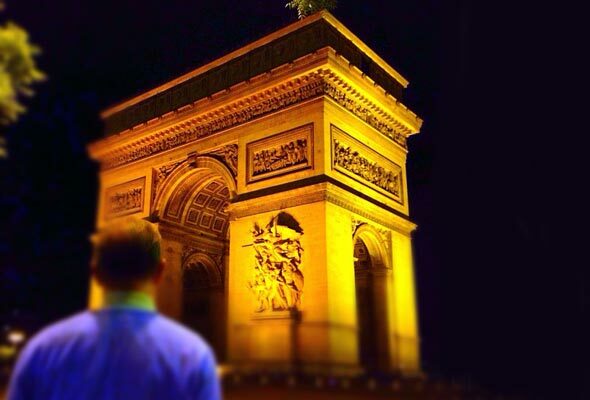 This post made me long for Paris. My husband and I traveled there almost two years ago for our honeymoon and I feel like I left part of my heart there. Your story was funny, delicious, touching, and simply lovely. You are inspiring to a novice writer like myself. I also can’t believe those are all iPhone pictures! They’re wonderful….time to upgrade my iPhone to the one with the better camera! Heather, first, happy second anniversary. And thanks for the kind words. I just got back to NYC, and I suddenly have an impulse to walk the cobblestone streets of Paris. Ah, well–next year. And, yes, do check out of the iPhone4S–but I’ve heard the next version will be even better. Happy Belated, Sweetie. I’m mehllllllting! Darling! Thank you. I thought of you when we arrived in Avignon on Sunday. The Mistral was blowing, and I shouting, “Dorothy! Dorothy!” The French thought I was mad. parisbreakfast, Je suis d’accord. PAUL has fallen to a last-minute, got-to-bring-some-food-on-the-TGV kind of place. It just was the first place we ate it when we started renting the apartment, so it has a special place. But…Guy Mulot is definitely on our list for each and every trip moving forward. What is its “breakfast of a sort”? I don’t imagine I could stay long in Paris without ruining my health – wouldn’t even eat food, just bread and pastries. Well, Jean, I only wish my accent was nonexistent, but it’s only a fantasy. I kind of get in the rhythm after a while, but I think my old French teacher from college would blanch. Only bread and pastries, Jean? What a lovely path to hell to walk down. I read your email a couple of months ago and it stuck in my mind because I always wanted to come to Paris (I am here right now), yay!!! My darling husband asked me casually what would I like for our first wedding anniversary (Sept 2nd)? I said, a trip to Paris. He said, “Not a diamond?” I said, “Mo, an experience of a lifetime, that’s what I want.” I made him read this article. So, he really did surprise me and booked our tickets. After the long journey from Chicago, delayed flights, we finally made it to Paris at midnight on a Saturday. To our astonishment, the international airport was closed until 6 am because everything shuts down here on Sundays. Our hotel is great in Bastille area. Once I had a good day rest, the rest is history. This is a beautiful city, the people are nice and friendly (not rude as many Americans believe), the food astounding, the TPE is keeping me afloat. I haven’t walked or eaten as much in my life as I have here in the past six days. The bread is amazing and the butter even more amazing. Berthillon ice creams are delicious. Upon your recommendation, we went to Gerard Mulot for a chocolate noir tart, I loved it. I must send you a picture soon. The two hour walk from Luxembourg garden was worth it, lol. My husband hates driving here but loves the atmosphere, the relaxed feeling people have, nobody is rushing to be somewhere. The cafes are always full and lively, people talk to each other, I have not seen one single cellphone. After we celebrate our anniversary, our visit is soon coming to an end but the memory will always stay with me. Thanks for your recommendation and the lovely article, it really made it definite for me to be here. Now that I’ve stopped crying, I can write more clearly. Thank you, Sumara, for allowing me to be even a tiny part of your first anniversary. So many writers and bloggers put their lives and experiences out there, and it’s not often we hear that it’s made a difference in someone’s life. 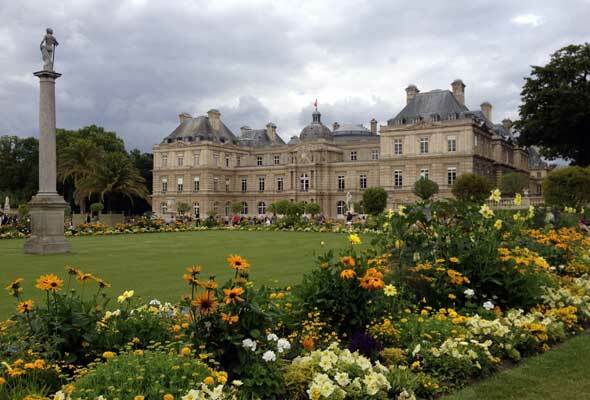 But to know that your trip to Paris, to the Luxembourg Gardens, and to Guy Mulot were partly because of my blog post is the best gift you could give me on your anniversary. And now it’s your job to pay it forward. Renee, our editor-in-chief, was the person who told me that I had to go to the gardens. (Strange because I’ve been to Paris countless times, and I never went.) And it was Alisa Morov of SweetPeaParis who told me about Guy Mulot. Next it will be you telling friends where to go, passing on some of what you got from us and adding some of what you discovered on your own. I wish you and your husband a wonderful anniversary. I can’t wait to see what you do next year! You are not alone being misty eyed after reading Sumara’s comment. You can only have one “first time” experience in Paris. And, if it is a good one, it’s magical. I love your blog! We communicated about the cataplana from Meste Ze in my quest to replicate it! You sent me a recipe for bread from Alentejo, and I must dig it up as I have bought myself a pizza stone. I will try these places when I go with my son to Paris for Christmas! 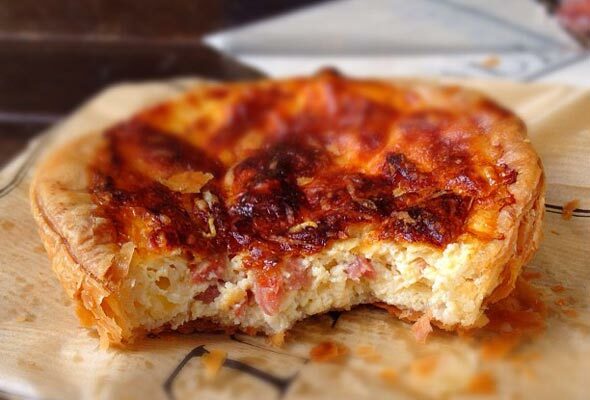 Dying to have Pasteis Belem outside of Lisbon….so we will definitely try Comme a Lisbonne! (Sorry, no accents on my netbook keyboard). The other places I love in Paris are the Algerian restaurants! Counting down the days – 45 days to Christmas! Hello Betty, thank you for your kind thoughts! I wish you and your son a wonderful Christmas season and trip to Paris. Take some photos for us and keep us posted.